When using a glider chair and ottoman set, there are some safety hazards you might want to watch out from. Here we put up a list of safety guidelines to help you avoid and prevent baby injuries when using such a set or breast feeding a baby on a glider chair. Rocker Glider Worst Case Senarios..
A glider rocking chair can be dangerous for baby or toddlers because it has many moving parts. As a rocker chair being on it means losing some of the balance. 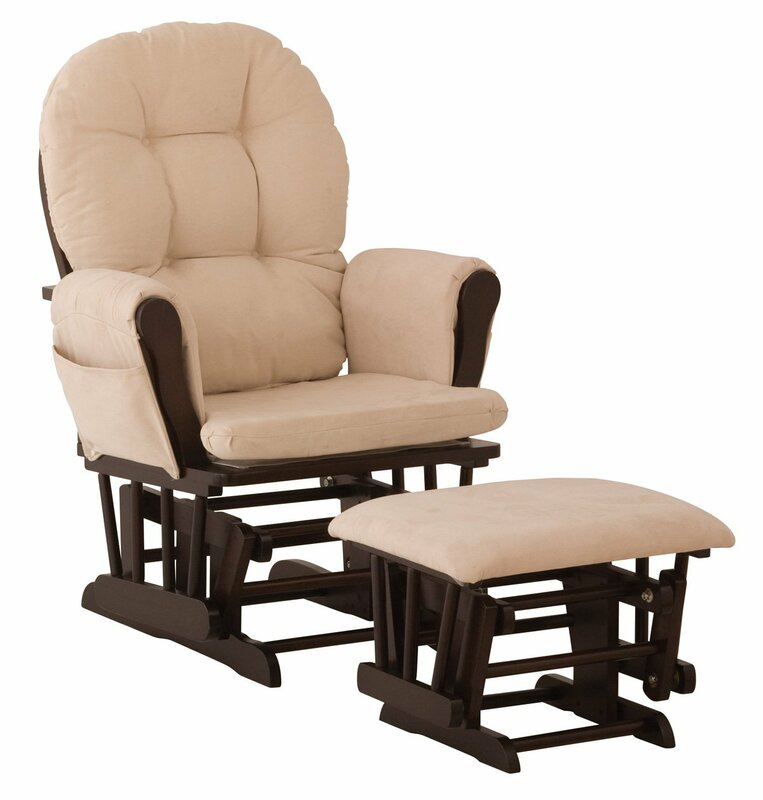 If the rocking glider chair is used with the legs placed high on the ottoman, the parent has even less balance. Take a look at the glider rocking chair and ottoman below.To achieve the gliding motion, there are two rows of bars and joints. The ottoman mechanism is the same. While they both are very relaxing to rock on, they can be unsafe due to their smooth motion. Here are safety tips we have collected for you, so you and your baby will both be safe, while enjoying a soothing ride on the rocking glider and ottoman set. 1. It might seem basic, but you should buy a glider and ottoman set from a known manufacture, who has reputation or building premium or sturdy furniture. Unlike a baby changing table or a baby sleeping crib, which do not have any moving parts, a glider and ottoman have to carry your weight and preform a smooth glide. 2. If you are overweight, make sure you buy a sturdy glider chair,which can carry your weight. Women after giving birth may have extra pounds to lose, and the glider should support this weight too. 3. Have a table near by, so you can put stuff on a non moving place. If you feed the baby in the glider chair, you may want to have a small table to place the bottle, wipes, a TV remote, your cell-phone. Trying to rush to a ringing phone from the glider sitting position, may cause you to trip over with the baby in your arms. 4. If you have small toddlers or kids in the house playing or crawling around the glider, do not rock the baby unless you see they are far away. You might be too busy with the baby and not notice they send their fragile fingers into the moving parts below.. Ouch! 5. Never leave the baby on the glider or ottoman without at least one hand on their chest or back. The most common injury in the States is babies falling from changing tables! DO NOT leave the baby on a glider or ottoman even for a second. Their body movements might cause a slight gliding motion which will throw them over. They will fall even before they know how to crawl. 6. When the baby grow teeth, do not allow them to chew the side handles of the glider chair. A sudden movement (like losing balance) may cause rough punch into their teeth. 7. The most dangerous part of being with a baby on a rocker gliding chair and ottoman, is when sitting down or standing up. The best advice is to seat and ask someone to hand over the baby when you are already seated. And let someone take the baby before you get up. If you are alone, place both feet on the ground, make sure you have 100% balance and then seat back slowly. Rise in the same way, first placing two feet on the ground before leaning forward and raising your body. Follow these safety tips to keep your baby safe when using a glider rocking system. We have found that Amazon has some really great bargains on some branded gliders and ottomans. Some of them have 25%-50% discounts. This entry was posted in Baby Safety At Home, Gliders & Ottomans and tagged Baby safety on Glider, Breast Feeding In a Glider and Ottoman, Glider, Ottoman, Safety Tips For Rocking With Baby on Glider with Ottoman by dekel. Bookmark the permalink.